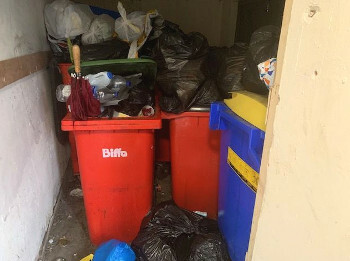 His photograph below shows the current state of the rubbish bins at the 'old compound' at Sutton Stop at the junction of the North Oxford and Coventry canals. Brian also showed a notice board by the Barley Mow at Newbold-on-Avon on the North Oxford reading: 'Nearest bins at waterpoint Brownsover'—'Rubbish bins Hillmorton', as no longer such services at the pub. He comments that next we will see rubbish discarded along the canal, and that CaRT is reducing the joy of boating and the itinerant boaters' way of life, and asks if John Horsfall wonders why he is so negative toward his organisation which appears top heavy.